Sometimes the Big Ideas of a book series can grow, and the author is left wondering, great, now, how do I make this work? With The World Weavers, author Kelley Grant considered the overall concept of the trilogy she’d written, and how to make the expansive big idea of it come to a satisfying conclusion. While watching the local news one night I began considering the likelihood that we’d created God in our image, because if he’d created us in his image and this was how he acted, we were doomed. It made me think of the Greek gods and goddesses, their very human flaws and how difficult they made life for mere mortals. My brain started clicking. What if there were truly a greater being, but not in our form? And it created humans, but found we couldn’t govern ourselves. That One being might create some deities in our image so they could understand us, to take care of us. But, if they were human-like deities with great power, what creature would protect humans from the deities’ envy and greed and selfishness? My dog put his head on my lap, but he was too loyal, too kind. My cat lounged on my brand new sweater, depositing fur and claw holes and gazed upon me with contempt and ownership. That seemed like a concept to write about – a land ruled by dangerous, capricious deities who were held mostly in check by great cats loyal to the One-being who created all. Throw in some rebellious humans and that idea served as the basis for the first novel of this series, Desert Rising. 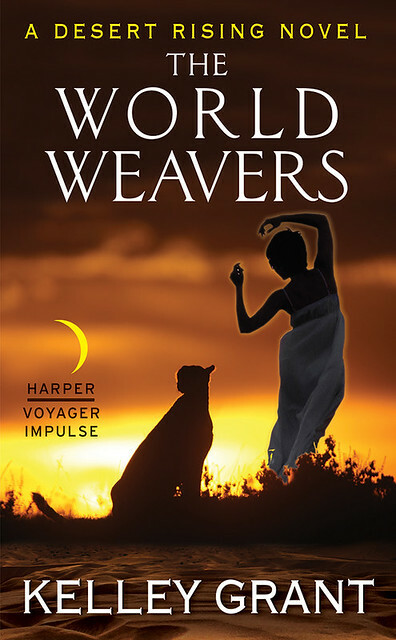 The World Weavers is the concluding volume of the series. I had to bring a human rebellion against the deities to a close. But how do mere mortals war against deities without being crushed like ants? How do you separate pieces of the universe and then weave them back into wholeness, when the pieces have minds and don’t want to be woven back in? I love David vs. Goliath stories where the little guy finds a way to triumph over incredible odds. As a little person who was bullied by larger kids in school, those stories inspired me with hopes of future revenge. In The World Weavers I’d created some pretty big, epic bullies for my heroes to cast down. Perhaps too big. It was at this point that I realized I was too stupid to write this story. In the first novel I’d created something of epic scope; an entire religious system, powerful gods, and two territories living in peace with a complicated trade network. In the second book I exploded both the religious and trade systems (oops) and created war. In this third book I was left with war and lots of pieces I needed to reassemble in some meaningful way. I knew the conclusion I needed to travel to, only, there were so many pieces…and they didn’t want to go together. I’m a smart person, but my brain hurt thinking about it, and I couldn’t afford to hire Stephen Hawking to write it for me. So I did what writers do. I drank…umm, just kidding. I put on my rainbow underpants and sat down and plotted. I put the characters together and learned through their eyes and personalities how to reel the deities in. Though I’m not generally a plotter, during writing I charted every essential action in every chapter because I knew I would be rearranging them. I realized that my characters could not win against the deities through sheer strength. So they had to be sneaky. Sneaky is fun. World Weavers is one large, carefully plotted trap with everything at stake and little certainty of success. But maybe, just maybe, my heroes will score another victory for the little guys. That sounds like a bang-up idea for a book series. It really is hard to reconcile why there’s so much trouble in the world. Why do we have to struggle so much? Why do good, innocent people or other creatures have to suffer for no reason? How much is pure chance? How much can we control? What should we do that’s right? What shouldn’t we do? … All those big questions of life. It’s hard to avoid them, no matter what we believe or what faith we follow, if any. What I went through during my grandmother’s long illness, and what I’ve gone through since she’s been gone have really made me question things, and there’s anger and sadness and frustration there…and sometimes it’s too much…but there’s also beauty occasionally, the unexpected, the wonderful or funny. I try to remind myself of that. (Right now, my budget’s bad, and Monday and for a few days, I’ll be without power, so I won’t likely see responses until I have utilities again. Yeah, it’s not good. I’m self-employed, but I’m expecting to apply for welfare…never done that before. Scary. But I am going to be stubborn.) On the matter of cats, my two are lordly, but they also seem to have this odd faith and loyalty in me. OK, the ability to open cat food cans does help. ;) But still, maybe they see something I can’t. Hope so. Anyhow, back on topic. — Another, very different take on the Big Idea the books apparently deal with, was a Star Trek novel, I think by Diane Duane rather than Vonda McIntyre, called The Wounded Sky. This presented a godlike being that was outside of Time, didn’t perceive time as we do. In some ways, it was similar to (and predated) the Wormhole Aliens / Bajoran Prophets from Deep Space Nine. Both her book and the DS9 pilot episode, “Emissary,” present interesting takes on deities and godlike powers, and both had some really interesting takes on how things end up. Recommended. It sounds like this book series would be another, but very different, look at the Big Idea. By the way, I’ve been rewatching Stargate Universe, when I need a break from working extra. I’ve enjoyed it (again) with its flaws and strengths both. It’s as good or better this rewatch. I did notice a certain author listed as a creative consultant. I’ve also discovered there was a lot more of Stargate SG-1 and Stargate Atlantis that I never had seen before, so (someday) I’ll get to watch more. P.S. — I’m doing font production, getting my first fonts ready, so there’ll be income in the pipeline eventually. But this takes time, and like with novel writing, you work for a very long time, you submit it for publication, and you hope a vendor wants to publish your fonts for sale. You then get your cut and they get theirs, and you get the benefit of their reach, their marketing, to get your sales. This also means you start off as an unknown, untried quantity, you work on speculation until you get published, and then you see how much the buying public likes your work…so you can keep doing it (and put food on the table). I’m learning just how much goes into creating fonts. It’s a lot of work! The vendors want more these days, so what I’d thought my timetable was, is taking a lot longer, and I’m not currently as sure when I’ll get my first entries submitted. But the sooner the better. I’ll be much happier once I have them out there selling, earning me (gasp) income again. Dang right, I’ll sell my art. Eating and a roof over my head, working utilities, and paid bills — are very good things, yes, they are.